What materials should I use for building my trailer frame? It’s a common question with strong biases for Rectangular Tube or I-Beam or C-Channel. Also, choices of Aluminum versus Steel. So, which trailer frame material geometry is best? In this article we’ll give some insight for function, but ultimately, the decision is yours. The needs of your circumstances should drive the material picks. While it’s great to talk about Aluminum vs Steel, we’ll refer that back to previous articles. Aluminum vs Steel Part 1, then the following Comparison Part 2, are both good reading with a lot of detail. Also, the Article on Beam Shape is great background for selecting trailer frame material. Honestly, the beam shape article and this one began as one article that got too long. You can think of this article as the application of beam shapes for trailers. The intent here is to give insight on beam types as you plan your next trailer. 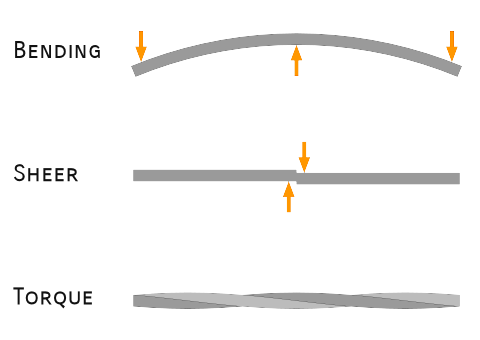 In general, there are three types of beam loading: Bending, Sheer and Torque. To understand them, here are some quick illustrations. We won’t go into detail with these except to say that elements of all are present in a trailer frame. Bending is the big one we think about for main beams running front to back on the trailer frame. Also for cross members going side to side under the cargo. Examples of Shear Forces include areas where the suspension attaches, or where the tongue intersects the front cross member. While Torque loads are not as prevalent in most trailer frames, the effect is still there in some degree. Twisting often is the result of something attached to a frame member and hanging off to the side. (A side mount tongue jack for instance.) Or when the loading is bias to one corner of the bed. Interestingly, it is rare that the above loading conditions exist in just one pure form. Usually there are degrees of 2 or all 3 in a beam. Take for example the main beams. There is the obvious bending load, then sheer present in part from the bending, and in part from the cross members that attach to it. (Also the suspension loading, tongue attachment, etc..) Then, there is Torque load on the trailer frame material because of the cross members (and outriggers if it has them). True, the primary loading is bending, and normally Torque loading is small, but just know that all is not as simple as it first seems. To do the calculations, there are free resources online. One is at engineeringtoolbox.com. It’s good information with explanations and links, and it has free calculators, but the site is pretty cluttered. Also, in calculating, don’t make it more complex that it needs. Start with general calculations, then hone in on the areas that need more attention. Different portions of the trailer frame have different needs, and that obviously drives part of the decision about trailer frame material. For illustrative purposes, let’s think about a typical frame and describe the beams as well as their needs. This illustration will work for the discussion, though keep in mind that every frame is a little different. We will refer back to the beam shapes described in the previous article for most of the below discussion. If you’re not familiar, please read that article. We’ll call the beams that typically run the length of the trailer bed — front to back — the main beams. They are usually the longest beams on the trailer and hold (effectively) all the weight. Their need for strength is high, then depending on length and trailer type, stiffness also comes into play. Look in the beam shapes chart for those with good vertical strength per weight. Incidentally, these are often the heaviest pieces in the trailer frame material, but they are not usually the biggest contributor to weight. Another common requirement of main beams is the connection with other systems. They (usually) connect the other load carrying elements — like the cross members, the tongue, and the axle(s). Technically the springs. In this colorful image you can also the the little zigs in the stress which indicate changes in the shear forces. For shorter-ish trailers, C-Channel and Rectangular Tube are common. Some considerations are ease of connection with other beams, interface with the deck, and corrosion. Tube is great to work with as the full rectangle is easy to fit attaching pieces (like cross members). Some people don’t like tube because you can’t paint the inside. That is a consideration, but it’s also pretty easy to seal the ends with a cap. Some people like Channel because you can bolt directly through it without squishing it — unlike tube. Either can be a good choice, and much depends on how and where the trailer will operate. For longer trailers, I-Beam becomes the shape of choice — particularly tall, narrow flange beams. Cross members are not as long as main beams, nor do they each carry the full cargo load. Typically, cross members span the width of the trailer to support the decking and share the load carrying duties. Wider trailers generally require stronger cross members. Open section beams like L-Angle or C-Channel work well for cross members because they are easier to bolt through. Simply drill a hole through one wall, then use a nut and bolt. When attaching the decking with bolts, these shapes work well. The open sections are also easy to protect from corrosion (paint completely). When choosing material, consider the loads it will carry. For something like a tractor hauler, the load is applied to the deck in just a few locations, so each cross member must be stronger. However, when hauling rocks or boxes the load spreads much more, and each cross member shares the load. Your choice of trailer frame material for cross members depends a lot on the intended loading, and the width of the trailer. The special case of the first and last cross members is unique — bed front, or the back one called the bumper (depending). Anyway, the cross members connecting the perimeter of the bed usually carry greater load, and therefore, have significance. The front member transfers a lot of the bed load to the tongue. The back member often acts as a bumper, but also carries the load of nearly everything that comes onto the trailer. Ramps and other loading rely on the back cross member. For the reasons above, these two special cross members are usually stronger than the others. Like the main beams, C-Channel or Rectangular tube are good for this trailer frame material. One nice benefit of C-Channel in the back . . . you can set the tail lights into the channel for protection. These front and back cross members are a good place to angle brace or gusset as well. With many trailers the left and right perimeter of the bed are the trailer frame main beams. On others, there are cross member extensions, or outriggers, that extend the bed on each side in front and behind the wheels. The labeled figure (near the article beginning) illustrates a trailer frame that extends left and right beyond the main beams. It also shows the frame going up and over the wheels (not so obvious in the image). Material selection of all of these areas is important. The photo here shows typical outriggers — as fabricated brackets that are not a standard beam type. These are an example, but this approach is just one possibility. Read more about Outriggers in widening trailers. 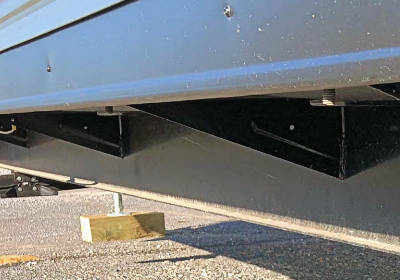 While beams connecting the coupler to the trailer may seem less important, tongues are usually high stress. The choice of trailer frame material in this area is critical. In particular, the area where the tongue beam(s) leave the front cross member. At this point, the loads of the main beams transition to the tongue beams. Additionally, the tongue often carries obnoxious loads like jack knifing or offset jack loads (torque). For the tongue, the ability to carry some twisting loads is important. Rectangular tube and Channel are the frequent choices for Tongue beams. Tube carries torque loads better, but with some cross bracing C-Channel also works very well. Depending on the design of your trailer, if a single center tongue beam is used, angle braces out to the main beams are helpful. The angle beams don’t carry as much load so making them of L-Angle or C-Channel is often great. Again, all of this depends on the capacity of the trailer and the expected loads. As a word of caution, don’t ignore the tongue beams, and don’t negate their importance. I’ve seen many trailers with the tongue tubes bent right where they intersect the frame. From an engineering standpoint, that is a critical area for trailer design. As shown in the image near the top of this article, some trailers have a separate perimeter members. (In many trailers the main beams also serve as the side perimeter.) The discussion on Perimeter trailer frame material is interesting, because many trailers have outriggers, but not an actual perimeter frame member. If you need or want one, it’s function is much like that of the cross members. See below for the discussion on commonality, and look at the needs for perimeter members in that light too. If the perimeter members will support things like side rails, the need for torsional strength might be important. Side rails often have big loads pushing them out, requiring stiffness in the trailer frame where the side rails attach. If, on the other hand, the perimeter serves only as the edge of the bed support, the strength need is significantly reduced. For a tiny house the primary load on the trailer is placed through the walls onto the trailer at the perimeter. That makes a greater need for strength. For a tiny house, the walls attach to the frame on the edge, so all loading (including wind, bumps, lofts, roofs) go to the perimeter. Trailer frame material includes a lot of other pieces that depend on the construction and purpose. Perhaps perimeter rails, sides, tailgates, gussets and diagonal bracing. 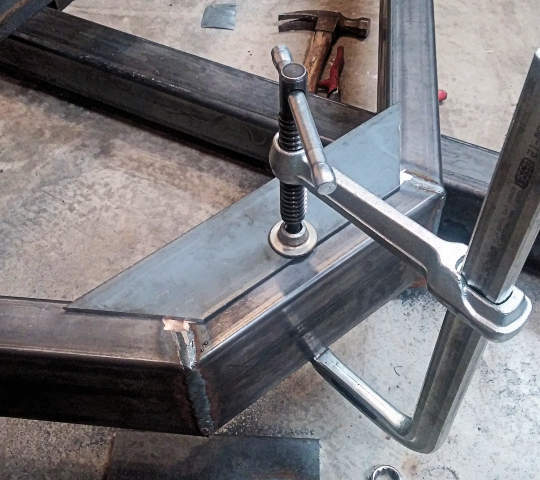 We won’t go into detail on these here, because there is a separate article about strengthening a trailer frame. Like the outriggers above, trailer frame material includes all of these extras. It also includes brackets and other fabrication items that are not really beams. Selecting these for the application is just as important as selecting the main beams. One quick plug for gussets — use them. Many trailers have inadequate gusseting or angle bracing which contribute to flexy frames. Gussets don’t cost much and they don’t add much weight, but they help a lot with stiffness. After the above thoughts on material for various areas, some may think about a different material at every location. For DIY projects particularly, we suggest finding some commonality. For instance: Can you use the same trailer frame material for the main frame and for the front and back cross members? Material comes in standard lengths. So, when selecting the type, make choices that best consume what you buy. This reduces scrap, and makes the project more efficient — especially for smaller parts like gussets and outriggers. It might be a little overkill in one area or another, but commonizing material will reduce the cost. For example, let’s say L-Angle is the choice for cross members. The gussets may not need to be that strong, but using scrap from the cross members might save you from purchasing another full stick of something. And, it won’t change the total weight very much. Compare the strength and stiffness characteristics of Rectangular Tube v. I-Beam v. C-Channel v. L-Angle as you make choices for trailer frame members. Main beams and Cross-members have similar, but different roles on a trailer. Beam choices matter. Proper selection can be the difference between a solid feeling trailer and one that feels (and probably is) wimpy. Over-built trailers are certainly stiff and capable, but heavier perhaps than necessary. Under-built trailers tend to flex and twist and bend. They are lighter, but not up for a lot of jobs. They can also be dangerous. Which is better? When selecting trailer frame material, it’s better to over-design and over-build than to have something dangerous on the highway. Choose your beam type based on needs and hopefully some engineering equations. Also, make sure you include appropriate safety factors. Finally, finding ways to distribute the loads more evenly makes the beam requirement less. Certainly the way springs are connected, but also a lot of little things like spring length have an effect. Don’t compromise when it comes to safety. Good luck with your trailer building project.